The decision of the Thailand government to lift martial law on April 1 has failed to appease critics after General Prayuth Chan-ocha signed a new law that imposed harsher security measures across the country. Martial law was declared on May 20, 2014 to restore order in the nation’s capital, which was besieged at the time by street clashes between pro-government and opposition forces. Two days later, a coup was launched by Prayuth, who established a government called the National Council of Peace and Order. The NCPO drafted an interim Constitution that was used to appoint government bodies including the legislature. Prayuth’s appointees subsequently named him as the country’s prime minister. But despite the existence of civilian agencies, martial law was retained. The government was probably hoping to deflect international criticism when it revoked martial law this week. Yet it is hoping to restore confidence by replacing martial law with Order Number 3/2558 (3/2015), which invoked article 44 of the interim constitution to justify the enactment of extraordinary security-related measures. For some critics, the new order is akin to the draconian provisions of Thailand’s 1959 charter, which gave the military leader vast powers to persecute and prosecute the opposition. The new order provides the appointment of “peace and order maintenance officers” from the ranks of the military who are given broad powers to defend the security of the state. These army personnel can search homes, summon and arrest troublemakers, confiscate property, and detain suspected individuals in special premises for up to seven days even without judicial authority. 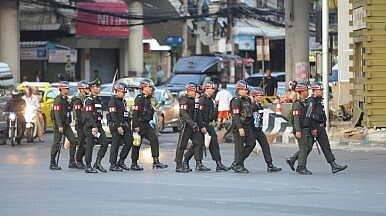 “Civilians are also at risk, as people who communicates and discusses topics through online social media that contain information viewed by the authorities as threat to national security, cause of public alarm, spreading of false information or public misunderstanding will be punished on the same condition,” the media groups warned in a joint statement signed by the Thai Journalists Association, National Press Council of Thailand, Thai Broadcasting Journalists Association, and News Broadcasting Council of Thailand. Meanwhile, the Thai Lawyers for Human Rights reminded the public that the order didn’t remove martial law in the southern border provinces of Pattani, Yala, Narathiwat, and the four districts in Songkhla. A Muslim separatist movement is currently active in the southern region. Even the National Human Rights Commission, which rarely criticizes the NCPO, issued a statement about the detrimental impact of the measure. “The PM has to be cautious about falling into the trap of having so much authority, which could lead to criticism later on. During a time that the country is trying to promote national reform and solve inequality issues, I doubt that it’s suitable to use Article 44 or martial law,” said NHRC Commissioner Niran Pitakwatchara. Instead of assuring the international community about its commitment to democratic transition, Thailand further damaged its reputation by choosing to affirm its restrictive policies. “Normally I would warmly welcome the lifting of martial law, but I am alarmed at the decision to replace martial law with something even more draconian, which bestows unlimited powers on the current Prime Minister without any judicial oversight at all,” said UN High Commissioner for Human Rights Zeid Ra’ad Al Hussein. The move, condemned by the UN, reflects an increasing alignment.